Arabic dance or belly dance has a diverse and widespread network of teachers and pupils. There are many different styles, which can be very confusing at first. We dance, perform and teach an Egyptian style strongly inspired by the teachers of The Raqs Sharqi Society. Raqs Sharqi literally means Eastern Dance. This dance is grounded, dignified and centred. Good posture and proper use of the body is encouraged. Tomb painting of dancers and musicians at Giza and the Ghawazee of Cairo in the early 20th century. 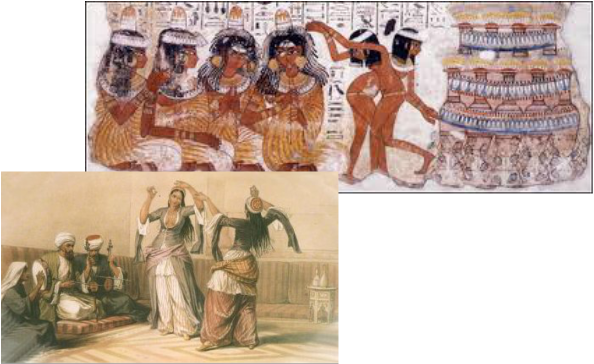 Dancing has taken place in Egypt since dynastic times. Tombs at Giza and other sacred sites can be seen which depict dancers and musicians. Egyptian Dance can be split into three broad forms. ‘Sha’abi’ is the folk music of Egypt. It includes the simple songs of the Fellahin (peasant farmers) as well as the more complex rhythms from Sa’aid (in upper Egypt) and the dances of the Ghawazee (gypsys). These styles are generally large and earthy, with the emphasis on joyful expression. An Ottoman Court dancer..........Anita, Diane, Carol and Ellie perform a contemporary Sharqi piece. 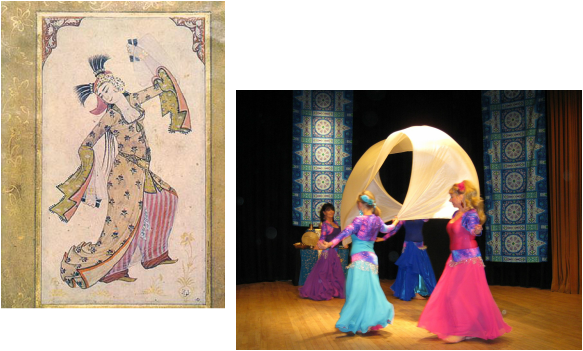 ‘Sharqi’ is the classical form and shares its origins with all other Arabic dance in the courts of the Ottoman period. Great Ottoman patrons paid for composers, musicians and dancers. As with pharonic period dance, there is no way to know what this dance would have looked like. Music survives and so do paintings, so it has been reconstructed by the dancers of today as 'Courtly Classical'. The last century saw the classical music orchestrated by the great Egyptian composers such as Mohammed Abdul Wahab and danced by the great stars of Egypt. These dancers were influenced by ballet and so the dance became more expansive and even contemporary in recent times. Of the country...of the soul of Egypt. Diane, Ellie and Kim perform a baladi piece in 'Ayoum Saeeda'. combined them with the new jazz musical instruments (eg saxophone, accordian). baladi is made of ten parts (ashra means ten in Arabic), although other sources say that 'ashra' means 'the big one' in the context of an ashra baladi. This style of music has continued to develop through the electronic age to become a pop culture as diverse as ours. Baladi is usually performed by a solo female dancer. She interacts and improvises with the musicians as well as the very noisy Egyptian audience. Other styles of pop music include 'sha'abi', raunchy or political protest pop songs typical of artists such as Adaweia.